Amish built pergolas from Amish Structures provide you with a beautiful way to add sophisticated yet casual elegance to your backyard. The shade created by your new pergola can provide you with a cooler and more comfortable place to relax. This is the ideal setting for entertaining or relaxing with your loved ones. With an amazing range of styles, colors and materials to choose from, you can easily find the right pergola for your backyard. 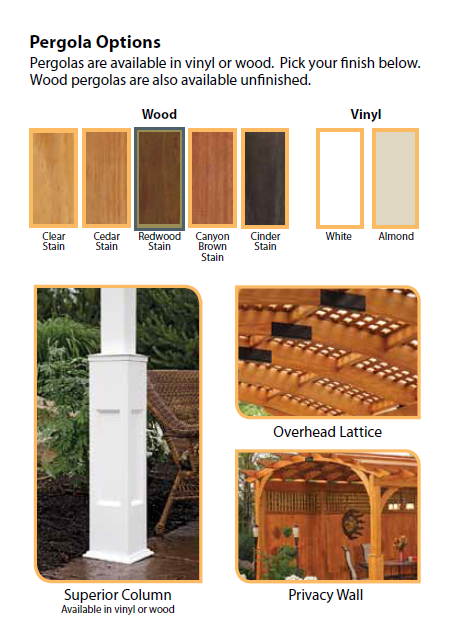 Call today for Delivery & Installation for an Amish Built Pergola! You can find many styles of vinyl pergolas and wooden pergolas available through Amish Structures. All are designed to be easy to install so that you can start enjoying the benefits of your pergola right away. While many enjoy the functional benefit of having a dedicated shady area in their backyard, others simply love the graceful elegance that it provides to their space. Pergolas have a timeless style that will make this a structure with infinite appeal in your space. You can enjoy the added aesthetic charm of your pergola now and for years to come. When you order your Amish built pergola through Amish Structures; you will have the option to choose between a vinyl structure and wooden structure. Both have their benefits to consider. For example, wood has a classic, natural appeal that many are looking for. Vinyl has reduced maintenance requirements due to its ability to withstand exposure to the elements. All of the pergolas from Amish Structures are impressively-made using time-honored craftsmen traditions. You can choose from pergolas that are attached to the home or that are free-standing structures. Shapes and sizes vary, and roofs can be flat or curved for added style. These are high-end structures that have the architectural detailing you are looking for. The kits can be customized to meet your needs through the selection of various options, and they are easy for you to assemble. Poly Lawn Furniture is also available for around your outdoor structure. Improving your backyard is easy to do when you purchase a pergola through Amish Structures. You can begin by learning more about the different types of Amish pergolas available for purchase and locating the style that will look best in your space. After installed, you will find yourself gravitating more to this space to enjoy time outdoors, and you may even entertain more frequently now that you have a lovely area in your backyard to do so. For vinyl and wooden pergolas in MD, contact Amish Structures today.